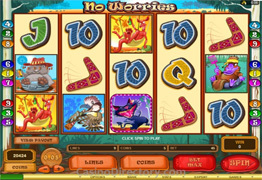 Slot Games listed are Nutty Squirrel Slot and No Worries Slot from Microgaming. This is a microgaming bonus feature video slot with 5 reels and 20 paylines. 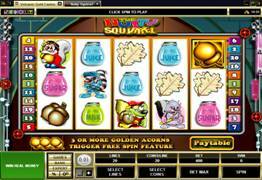 The Nutty Squirrel symbol appears on reel 1 and 5 and doubles the winnings. The bonus spins are triggered when 3 scattered gold acorns appear anywhere on the screen. 15 Free Spins will be triggered and all winnings will be doubled. The free spins can be retriggered over and over. Are you ready for a trip down under? Keep an eye out for the wombat, the wallaby, the koala and the platypus – all the Australian bush icons are here, and if you line them up you will enter the bonus feature and if you don't think you won enough, you can decide to have a second go at the bonus!. The Wild "No Worries" Symbol substitutes all symbols except for scatters.